Second Life developer Cory Ondrejka has left Linden Lab due to irreconcilable differences with the founder and CEO Philip Rosedale. While it is not quite clear whether he resigned or was fired, the bigger concern now is the future of Second Life. Cory and I have differences in how we think Linden should be run, differences that in the past few months have become irreconcilable. These are tensions that were more manageable when we were smaller, and there have been times that they have helped us do great work together. But now, as we change and grow as a company, I feel that we need a different set of strengths in engineering leadership. I strongly believe that this is the right decision, although not without pain, for both LL and Cory. In the absence of any official statement and just by reading between the lines, I would suspect this as a termination and not a resignation. You can also read Ondrejkaâ€™s farewell e-mail in Massively. However, it is very difficult to claim this issue will spell the downfall of Second Life. On the contrary, Linden Lab is confident this will bring a dramatic change to the virtual world. Currently, Second Life is notorious for being unstable, slow, frequently crashing, and very buggy. Research and Markets has announced the addition of â€œEntrepreneur’s Guide to Second Life: Making Money in the Metaverseâ€ to their offering. The Entrepreneur’s Guide to Second Life will give readers an in-depth look at businesses and other economic opportunities in Second Life, explain the business operations of each, and show readers how to identify, develop, launch, and profit from their own business. Written by Daniel Terdiman, an award-winning CNET reporter and and Second Life expert with deep ties to the business community, The Entrepreneur’s Guide to Second Life begins with an overview of the virtual world and its flourishing economy as well as the challenges it presents to entrepreneurs. A virtual business basics chapter discusses important features of all successful Second Life businesses, including marketing and advertising avenues. The following chapters discuss how to plan, start, and successfully run such businesses as real estate, clothing and accessory creation, construction and landscaping, adult opportunities, music and video production, art creation, and building and running entertainment venues. The Entrepreneur’s Guide to Second Life also features interviews with successful Second Life entrepreneurs, sidebars discussing practical considerations in each field, and useful resources for anyone who wishes to operate a successful, profitable business in Second Life. Linden Lab of Second Life fame today unveiled a new Identity Verification (IDV) system for its Residents. The voluntary system will provide an additional layer of trust for Residents and businesses, giving them new tools to determine how they interact with the Second Life community and how the content they create is accessed. The introduction of IDV will also help ensure that minors do not gain access to restricted content within Second Life, which is intended for users aged 18 or over. Access to Second Life content flagged as â€˜Restrictedâ€™ will be available only to those whose age has been verified as being over 18. Verification technology and data services provider, Aristotle, will provide its widely used Integrity Identity verification technology, which launches in Linden Labâ€™s beta today, before a full rollout to all Second Life Residents. Identify verification is voluntary, but will be required of any Resident wishing to access clearly marked â€˜Restrictedâ€™ regions within Second Life. The system requires users to enter specific identifying information, for example, a driverâ€™s license number, passport or national ID card number, or the last four digits of a social security number. This is then cross-checked against pre-existing databases of public record, to verify relevant aspects of a personâ€™s identity. Second Life users who prefer to forego identity verification are welcome to do so, and may continue to use the Second Life service, although their access to areas marked as â€˜Restrictedâ€™ will be prohibited. Coldwell Banker Real Estate LLC has taken the process of looking for a new home to an entirely new level by enabling buyers to tour an exact replica of a home for sale online. Coldwell Banker has created a 3-D reproduction precisely matching the specifications of a newly constructed $3.1 million Mercer Island, Wash., home, currently listed for sale by Coldwell Banker Bain on coldwellbanker.com (MLS# 27053398). 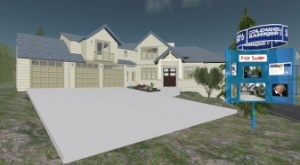 This home is available for showing to prospective buyers within the virtual community of Second Life. The experience allows Second Life avatars to â€œvirtuallyâ€ walk through each room of the house as if they were in the actual home. A variety of different touch points in the home allows interested visitors to instantly click through where they can ask for information about the home or even set up an appointment with Coldwell Banker Bain sales associate Suzanne Lane. This marks the first time that any national real estate brand has used the virtual community to market an actual home for sale. Users can visit www.coldwellbankervirtualhome.com for immediate access to the â€œreal worldâ€ home and to Second Life. â€œSocieties like Second Life are allowing industries to completely revolutionize how they interact with their consumers,â€ said Charlie Young, senior vice president, marketing, Coldwell Banker Real Estate LLC. â€œWhat makes this so unique is that prospective buyers can literally â€˜tourâ€™ this home from the comforts of their home and computer. Prospective buyers can get the most comprehensive view of the home possible short of actually visiting it. Manpower Inc. announced the launch of the Manpower Island in Second Life, the online virtual community. Manpower Island is a place where job seekers, employers and entrepreneurs can come together in an interactive forum to learn about and explore the World of Virtual Work, share ideas and identify new opportunities in traditional and non-traditional meeting spaces ranging from an amphitheater to a relaxing spot on the virtual beach. Built as a learning community, Manpower Island features a variety of virtual work resources, including an orientation trail to teach “newbies” how to move around, interact and teleport around Second Life; and a series of work-related stations offering advice on creating a virtual resume, preparing for both Real Life and Second Life job interviews, obtaining appropriate attire and finding a job in the virtual world. Manpower has developed a short informational video about the World of Virtual Work. The video examines how, in an environment of global competition, virtual work has become a powerful way to connect skills and demand, regardless of the distance between them.